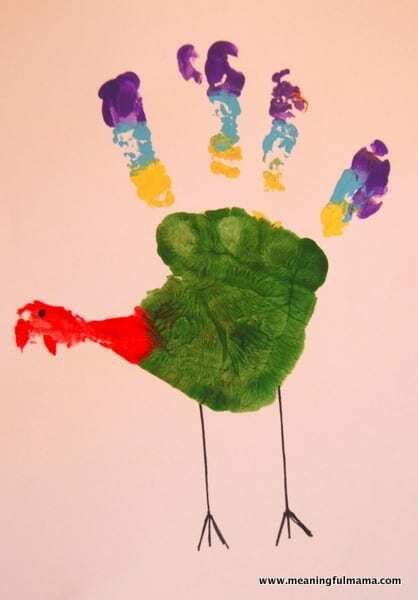 I love the look of these handprint turkeys. We all have seen handprint turkeys before, but when I saw this design at Room Spot Mom, I loved it and wanted to do it with the kids. All you do is paint their hands your desired colors. Put their hand down on the paper. After it dried, I painted on the gobbler and drew in the legs and eye with a thin Sharpie. The kids love the feeling of getting their hands painted, and it’s is a great keepsake as their hands are going to only keep growing larger. Thanksgiving is such a fun time to celebrate with family and focus on all we have been given by God. The traditions we pass down during this time – of food (thus our turkey, of course), family, crafts and friends will only create a stronger bond as traditions help define a part of who we are as a family. They also give kids things to look forward to and help themselves better identify what is important in life. I hope this craft brings you sweet moments and memories this Thanksgiving season. 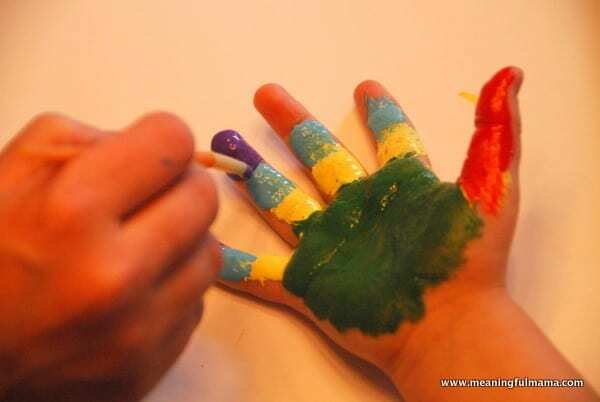 How funny, I just pinned a post about making kid handprint art. I like the turkey!